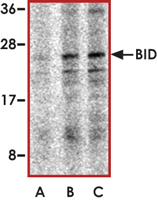 Sample Data :Western blot analysis of BID in mouse lung cell lysates with BID antibody at (A) 0.5, (B) 1, and (C) 2 ug/ml. Scientific Background :BID is a BH3 interacting death domain that heterodimerizes with either agonist BAX or antagonist BCL2 (1). BID is a member of the BCL-2 family of cell death regulators and is a mediator of mitochondrial damage induced by caspase-8 (CASP8). BID initiates apoptosis by binding to regulatory sites on prosurvival BCL2 proteins to directly neutralize their function. Multiple alternatively spliced transcript variants of BID have been found, but the full-length nature of some variants has not been defined. BID together with Cathepsins play an important role in the actions of Camptothecin on breast cancer cells (2). 2. Lamparska-Przybysz. M. et al: Cathepsins and BID are involved in the molecular switch between apoptosis and autophagy in breast cancer MCF-7 cells exposed to camptothecin. J PhysiolPharmacol. 2005 Jun;56Suppl 3:159-79.